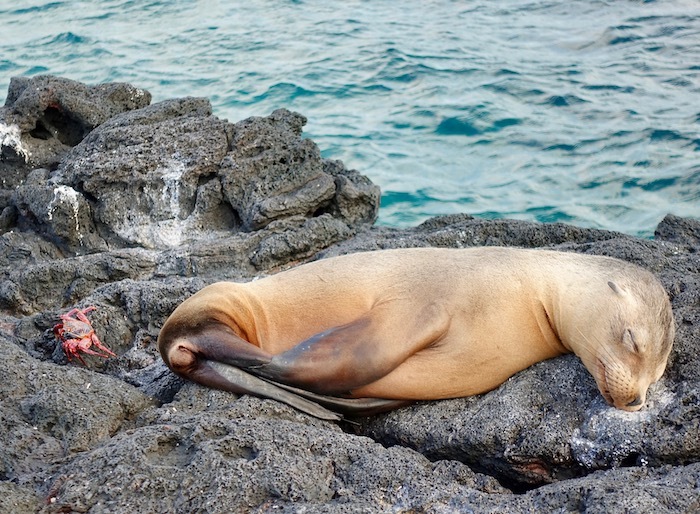 Galapagos Islands animals are like nothing else on earth. The wildlife sightings you’ll experience in this remote archipelago can transform your trip into an exceptional expedition. 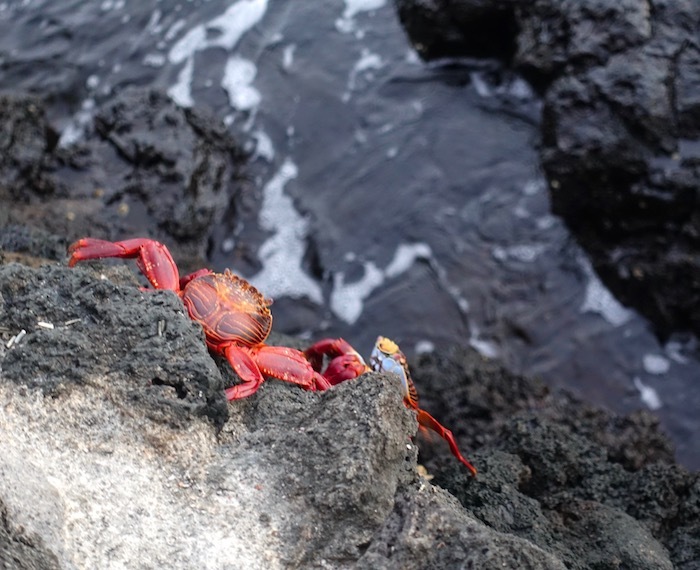 Here are some of the fascinating encounters I had on a cruise to the Galapagos as a guest of Metropolitan Touring on the Santa Cruz II. A Galapagos penguin zips beneath me like a mini torpedo. I fumble with my GoPro, roll onto my back by accident then flail my arms until I’m facing down. By then the penguin has sailed off towards the silvery grey cliffs of Bartoleme Island. Splash! It’s in front of me again. Then it’s gone. I spit out my snorkel tube, hardly able to breathe in excitement. “I just saw a penguin!” I half gasp, half bellow to the snorkelers sprinkled around me. 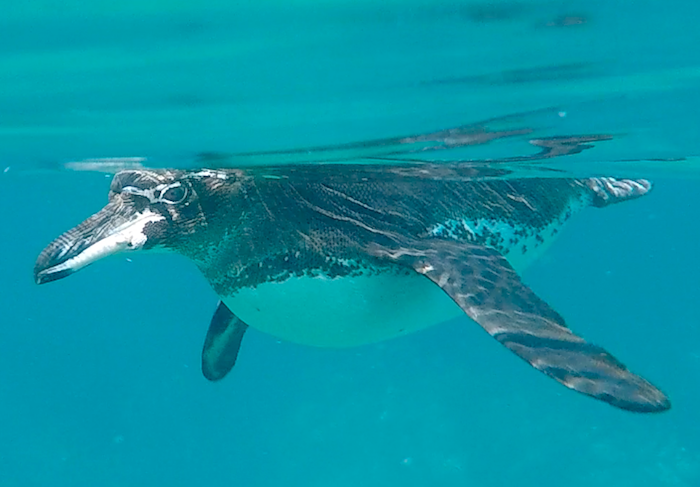 And if I can’t exactly claim I swam with a wild Galapagos penguin, at least I can say I was floundering in the water as one swam by. If only it had stayed around, I think as I start the swim back around Pinnacle Rock to the beach. The Galapagos penguin is the rarest of all penguins, the second smallest in the world and the only one that lives on the equator. I wanted it to love me. I want to be the Penguin Whisperer. 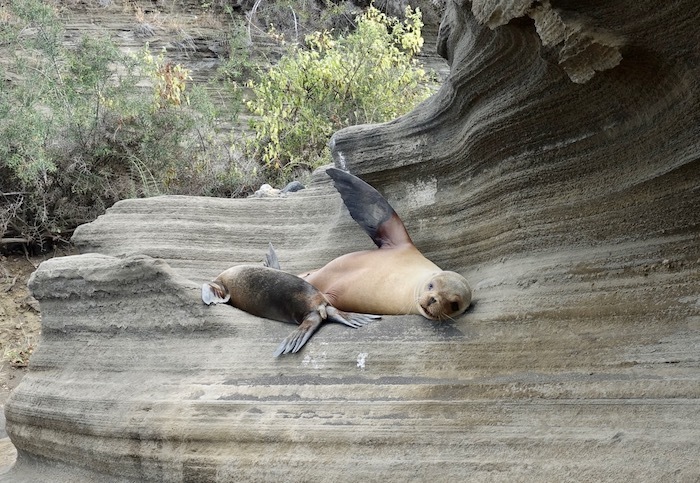 However fleeting, the penguin sighting – along with many other surreal and spectacular animal encounters on this Northern Galapagos itinerary – is a highlight of my five-day cruise on the Santa Cruz II, a 90-passenger ship owned by Metropolitan Touring. 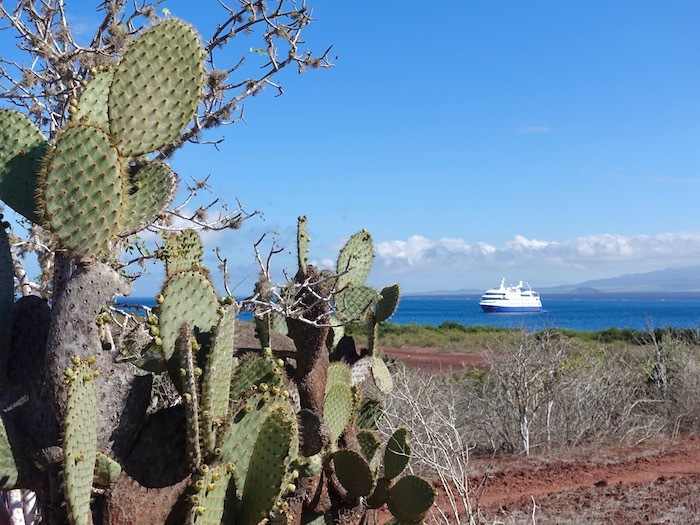 Established in 1953, Metropolitan Touring is one of the pioneers of Galapagos cruising, and their voyages emphasize interpretation and conservation while ensuring minimal impact on the fragile ecosystems of the Galapagos. To say there is plenty of wildlife to get close to in this isolated archipelago 965 km (600 miles) off the coast of Ecuador is an understatement of tropical whale proportions. Ninety-seven percent of the Galapagos is a national park, and the vast majority is off limits to the public. Made up of some 20 islands, 42 islets and hundreds of lonely rocks, this volcanic region in the Pacific covers an expanse of 138,000 square kilometres (53,282 square miles) altogether. Our voyage on the Santa Cruz II includes stops at Santiago, Rabida, Bartolome, Genovesa Island and Santa Cruz Islands, and we’re aiming to see 12 animals out of the Big 15. So far so good. 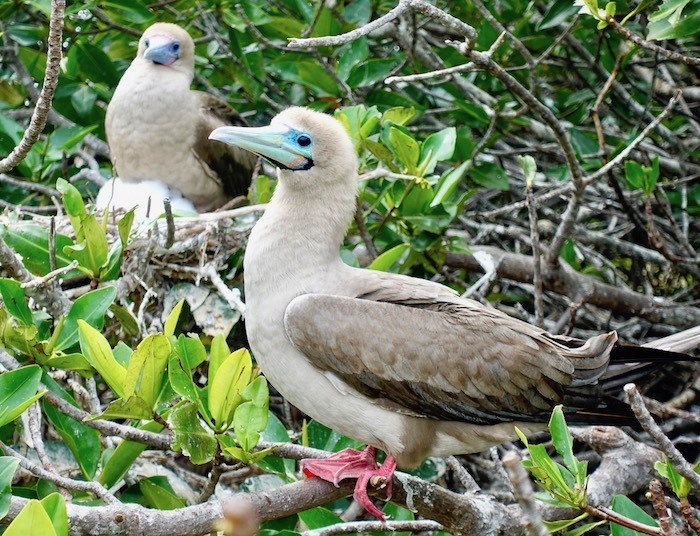 We’ve seen blue-footed boobies dive bombing into the ocean, sea lions lolling on the beach, marine iguanas huddling on rocks and frigates gliding overhead like black feathered pterodactyls. Now I can add a Galapagos penguin to the list. It’s no surprise I’m one of the slowest snorkelers back to the beach. Clearly, I wasn’t a dolphin in a former life, but who cares? The water is calm and I’m being trailed by a couple of naturalist guides in a panga (like a zodiac boat or a motorized dinghy) who keep us in sight. I veer over. A giant tortoise is thundering through the green water toward me. I get my GoPro ready then splash out of the way when I realize it’s going to pass directly beneath me. I don’t want to kick it with a flipper. I also don’t want to get railroaded by a century-old tortoise. The largest living tortoise species in the world, the Galapagos tortoise can weigh up to 250 kilograms (550 pounds). Luckily for me they’re vegetarians. After the tortoise excitement I stagger out of the water exhilarated. 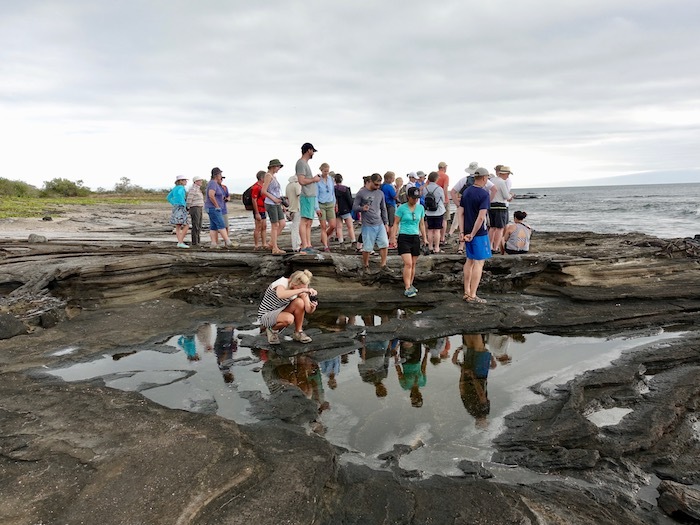 The Galapagos isn’t just about seeing wildlife, it’s about connecting with the origins of life itself, as much about our own evolution as it is about the creatures we’re seeing. After all, it was Charles Darwin’s five-week visit here in 1835 that laid the groundwork for his theory of natural selection. It wasn’t until after the voyage the significance of what he had seen truly sunk in. One of the most important realizations was how much a Galapagos Islands animal species can differ between islands. (Hello, Darwin’s finches!) Tortoises like the one I just saw can have different shell shapes depending on what island they’re from. Of course there are the famous finches. There are 13 types of finches in the Galapagos and the shape of their beaks is as varied as the collection of pliers in a handyman’s toolbox. Some are longer, thinner and/or pointier than others – the birds have adapted to the unique demands of the particular island they live on. In 1859 Darwin published On the Origin of Species, which revolutionized how we view the world today – though contrary to popular belief, the finches weren’t mentioned, it would be later biologists who realized their importance. Later as we gather in the ship’s blue-accented Panorama Lounge for our pre-dinner briefing of the next day’s excursions, we tally up our Galapagos animal count. “At this point it’s easier to count the ones we haven’t seen than the ones we have,” jokes Ramiro, our Ecuadorian-born Expedition Leader as he entertains us with stories of various Galapagos animal interactions. There’s the snorkeler who had to flag down the panga because a baby seal had hopped onto her back for a rest, and the darker tale of a young man who tranquilized four marine iguanas hoping to smuggle them out of Ecuador. “I think he’s still in jail,” Ramiro says. How many Galapagos animals will you see? Depending on what islands you visit and what season you’re visiting in, the number of animals you’ll see will vary, but you’re guaranteed to see a mind-blowing heck of a lot. While our group won’t see albatrosses, flightless cormorants or Santa Fe Iguanas – we’d need a different itinerary for that – and I didn’t snorkel past a manta ray the size of a queen-size mattress like another traveller did – I’ve seen fluffy red-footed booby chicks, a soaring Galapagos hawk, drowsy fur seals and flapping male frigates, their red pouches puffed up like Valentine’s hearts in a bid to attract a mate. And if you’d told me a week ago I wouldn’t have a heart attack when a white tipped reef shark swam beneath me I wouldn’t have believed you. 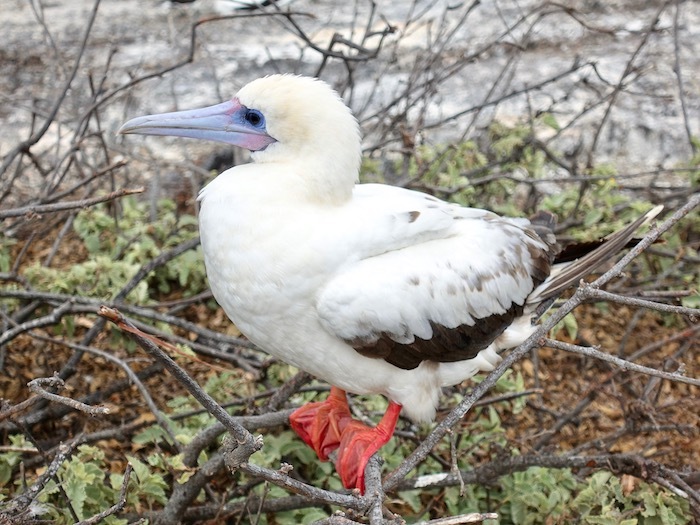 Not only have we seen the 12 out of 15 Galapagos animals we were aiming for, we’ve gone off the chart, adding racer snakes, lava gulls, Sally Lightfoot crabs (possibly named after a Caribbean dancer due to their ability to hop, skip and scuttle) and more. It’s culture shock of the most amazing proportions. 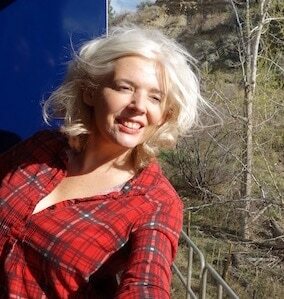 As we head downstairs to dinner an American man taps me on the back. “When you were in the water there was a penguin right behind your back. It stayed there for at least 30 seconds. I was trying and trying to call you but you didn’t hear me. What? I had a Galapagos penguin over my shoulder? I am the Penguin Whisperer after all! The lung-compressing rush I’d felt at my first penguin sighting flooded through me all over again, only now it was magnified. Who knew that the top moment of my trip would be one I didn’t even know I’d had? 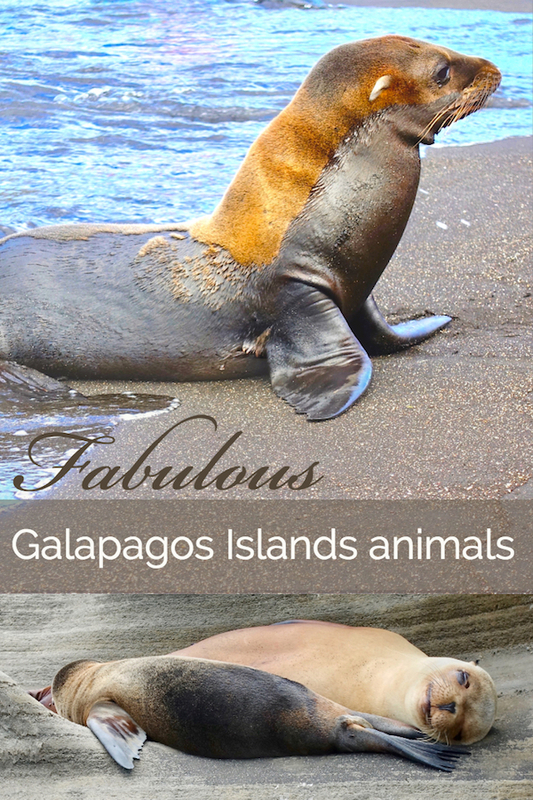 The following Galapagos animals are considered by many the top ones to see. 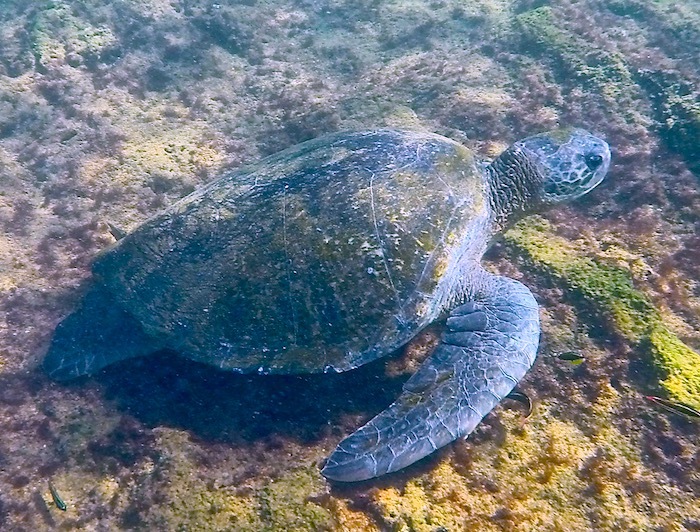 Like the 15 above, many are endemic to the islands. Galapagos Albatross – Found on Espanola Island, the Galapagos Albatross, also called the waved albatross, is the only tropical albatross. In order to fly, they like to hurl themselves off a cliff to gain speed. Paragliding has nothing on them. Blue-Footed Booby – While I did see blue-footed boobies, my biggest regret is that I didn’t get to see their crazy mating dance where the male shows off his fancy blue feet in a dance that’s as graceful as the Hokey Pokey. The brighter the feet, the more of a hit they are with the ladies. Nazca Booby – Snow white with black tail feathers, the black markings around the eyes give these beauties a Lone Ranger appeal. 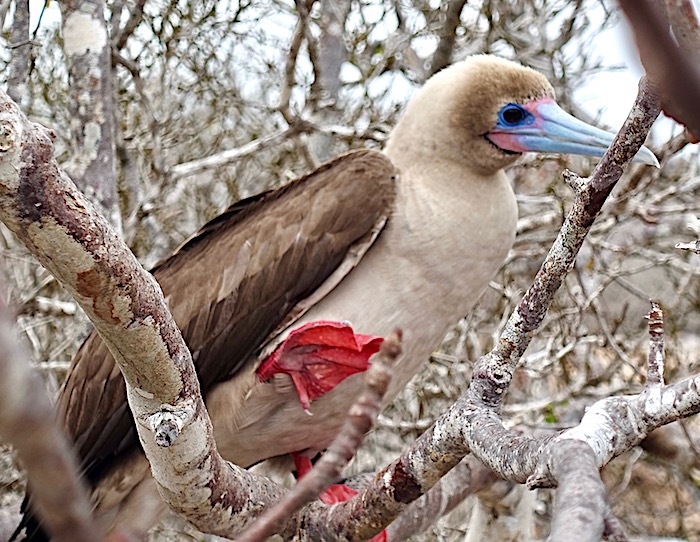 Red-Footed Booby – Their feet are red, their beaks are blue, red-footed boobies I love you. The best place to see them is on Genovesa and San Cristobal Islands. Flightless Cormorant – One of the rarest bird species in the world, the large flightless cormorant is only found on Fernandina and the west coast of Isabela Island. They’ve lost there ability to fly because it’s not essential to their survival. Galapagos Flamingo – These are a sub-population of the American flamingo and reside permanently in Galapagos. We saw two in a brine lagoon on Sant Cruz Island on our first day. Frigate seeking mate. Can offer a big red pouch and a nest. Fly-by-night females need not apply. 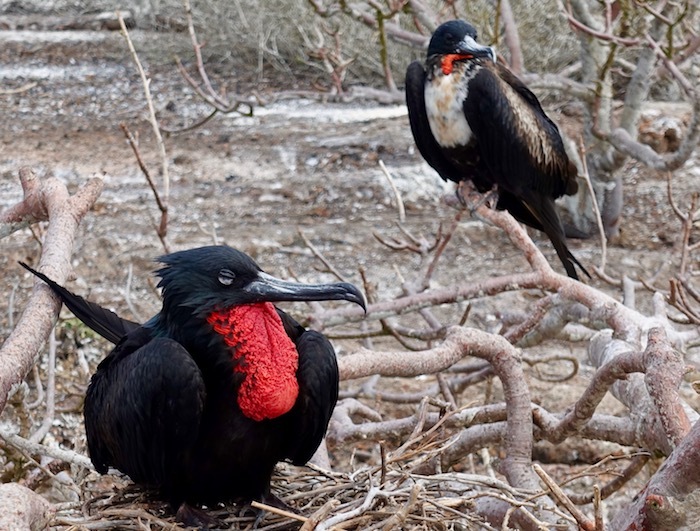 Frigatebirds – There are two types of frigates in the Galapagos: the ‘great’ and the ‘magnificent’ (and no, I am not making that up). In addition to having a riveting mating ritual, they’re skilled sneaky fliers and like to steal food. Galapagos Hawk – The largest bird of prey in the Galapagos, they love to dine on lava lizards. Yum. 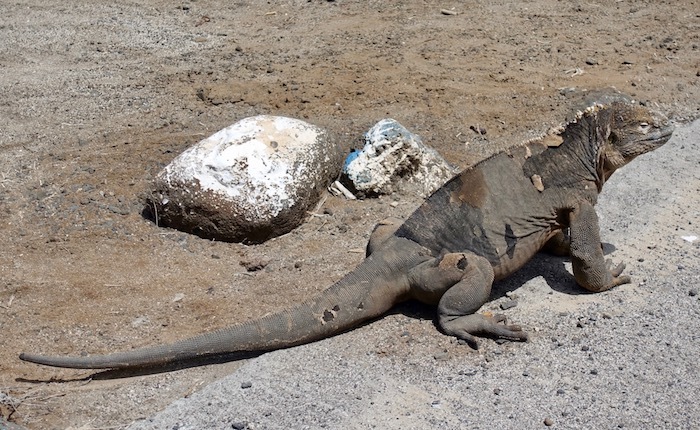 Land Iguana – We actually saw one at the airport on Baltra Island. Talk about a great opening act. They may look scary but they’re mainly herbivores. Santa Fe Land Iguana – These pale iguanas live only on Santa Fe Island. Galapagos Penguin – These adorable beasties have a population of only between 1,500 and 4,700 – half of what their numbers were in the 1970s. 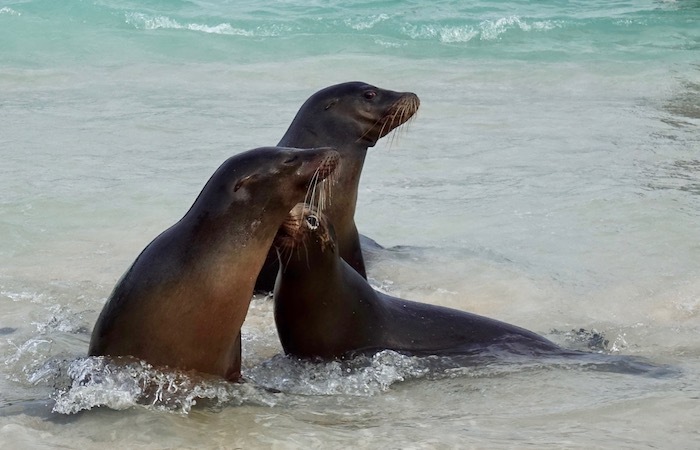 Galapagos Sea Lion – The most abundant marine mammal in the Galapagos, they’re also the most entertaining as they snooze, swim and laze right in front of you. Galapagos Fur Seal – The Galapagos fur seal is the world’s smallest pinniped. Who knew? And who knows what a pinniped is? Answer: It’s a carnivorous aquatic mammal. You’re welcome. Galapagos Giant Tortoise – These gentle Galapagos animals can live up to 150 years (the oldest on record lived to 152) and can grow to 1.5 metres (five feet). That’s a lot of tortoise. Why aren’t Galapagos Islands animals afraid of people? According to this enlightening New York Times article, the animals in the Galapagos are not afraid of humans because running away is a waste of energy if it’s not necessary. Thankfully, the days when whalers and pirates created havoc on the islands, slaughtering fur seals and cooking up tortoises as if they were insta-pot meals, are long gone, so today the animals have no reason to fear humans. Diamond Stingray – We spotted one just a couple of feet from the beach. Are they dangerous? Unless you’re an invertebrate or a small bony fish, you’re probably okay. Short-Eared Owl – We saw one on one of our twice-daily hikes. At least everyone else saw one. I might have seen a rock. 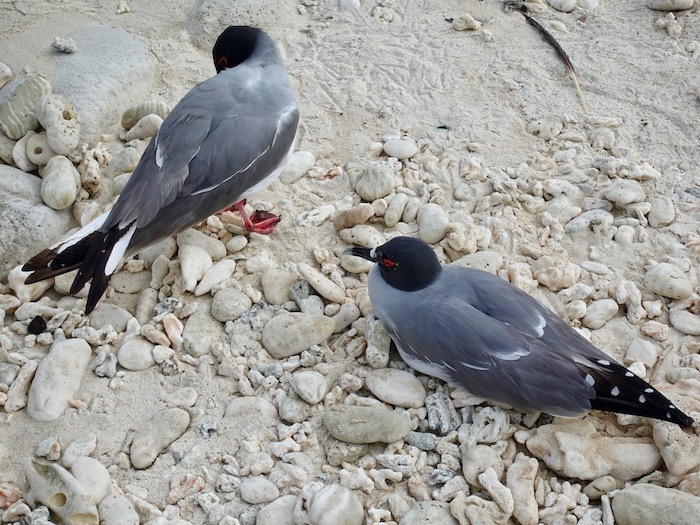 Lava Gulls – The lava gull is one of the rarest gulls in the world and found only in the Galapagos. There may be no more than 400 pairs in existence. Swallow-Tailed Gulls – The swallow-tailed gull is the only nocturnal gull. No wonder it has a red ring around its eyes. Mockingbirds – There are a number of mockingbirds in the Galapagos and one landed square at my feet. Clearly someone forgot to inform it about the six-foot-away rule. Racer Snake – You wouldn’t think anything could live on the barren volcanic rock that leads up to the summit of Bartolome Island but there it was. Only ‘mildly’ venomous, they’re considered harmless to humans, but you wouldn’t catch me cuddling it. The Sally Lightfoot crab, and essential design element in any outdoor space. Sally Lightfoot Crab – These bright orange critters are a wonderful accent on any black lava rock. Mother Nature’s decorating skills at their best. Metropolitan Touring is one of South America’s best-known travel companies, specializing in tours and itineraries where travel, nature and culture intersect. The company operates three Galapagos Island luxury expedition ships: the Santa Cruz II, Yacht Isabella II and Yacht La Pinta. They also own the Finch Bay Eco Hotel, a Condé Nast 2014 Readers’ Choice Finalist. About the Santa Cruz II. The newest ship in the Metropolitan fleet, the Santa Cruz II is also the largest, just over 70 metres long. The decor is breezy and contemporary, there is a guest to crew ratio of 3 to 2, and the cruise is packed with extras such as a glass-bottom boat, stand up paddle boards, pangas, snorkel gear and kayaks. Looking for a luxury hotel in Quito? Check out the historic Casa Gangotena. 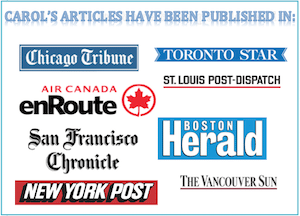 I was a guest of Metro Touring but all opinions and penguin love are my own. I really want to see the 14 species of Finches on the islands. I want to see all their different beaks that inspired Darwin’s theory of evolution. Plus I want to see a blue footed boobies (love their name). Wow Galapagos seem to be the perfect place for an adventurer: it must have been amazing experiencing the animals in their natural habitat. I would definitely like to do the same trip! Beautiful pictures! The Santa Cruz II looks like the perfect touring boat for the Galapagos. I loved seeing your review of all the different animals and birds. I had no idea there were many types of Boobies, Red, Nazca and Blue footed! I was fortunate enough to see the Blue footed mating dance — they also are found on a island near Manta, Ecuador – called silver island. Their whistle sounds like someone blowing out of a pipe! I am not a really big fan of birds (big ones) due to a terrible encounter a few years back (haha) but turtoises, seals and OMG penguins! How do I say no to that! 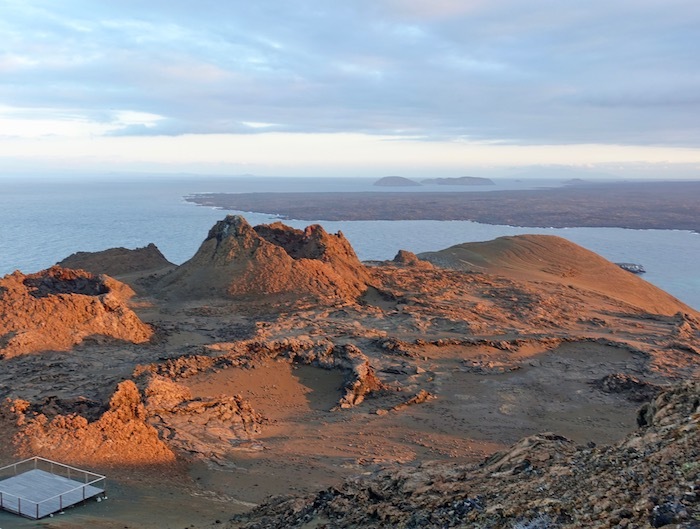 Also, Bartolome Island is also beautiful! I hope to visit Galapagos soon! So lucky you swam with a wild Galapagos penguin. That is an interesting info about Charles Darwin’s five-week visit here in 1835 that laid the groundwork for his theory of natural selection. Very informative post and great pics. What a fantastic experience! I’m glad to hear about the six foot rule that Metropolitan Touring follows. 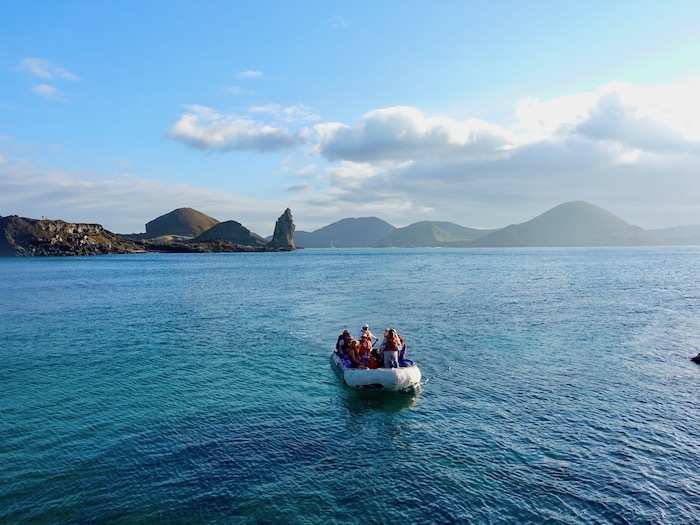 The Galapagos sounds like a great destination for a multigenerational trip. Was the snorkeling relatively easy or were the ocean currents strong? Oh, I’m so sorry you had to cancel your Galapagos trip, LDH. It will be waiting for you. I looked at this blog post with a little sadness. We were supposed to be in Galapagos this May but had to cancel our trip. Your post just wants me to get this scheduled again. I think the Blue Footed Boobies would be so fun to see. We would definitely want to snorkel. Not sure how I would react if a shark swam beneath me. We saw penguins in South Africa but really want to see more. Your list of animals we might see is really long. I guess maybe we will need to visit more than once. Thanks for the teaser. I agree, Elaine. 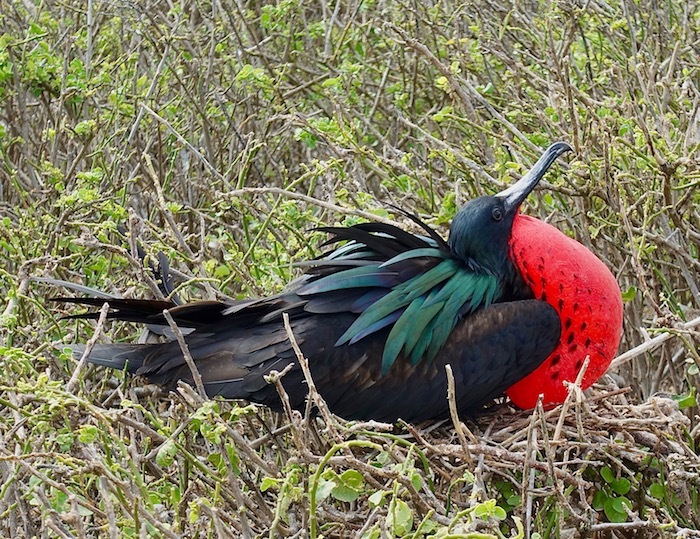 The Galapagos Islands are a universe unto themselves. I’ve been but on a smaller ship and really appreciated the naturalist guides. Getting close to so much wildlife is absolutely worth getting there. The Galapagos are truly rare. I hope they endure the popularity. Five stars for you, Jenn! Swimming with wild penguins was one of the best animal experiences you could have, Daniela. Absolutely! Galapagos has been on my bucket list forever, and it’d be a dream to be able to visit! I can’t believe the wildlife is so not scared by humans! How was it to… swim with a penguin? It must’ve been amazing! Knowing myself I would’ve melted right away!